This article is about the plant genus Amaranthus. For other uses, see Amaranth (disambiguation). "Amarantus", "AMARANTHUS", and "Doodo" redirect here. For the ancient Greek writer, see Amarantus of Alexandria. For the Momoiro Clover Z album, see Amaranthus (album). For the Songhai drum, see talking drum. For the grain, see Amaranth grain. For other uses, see Amaranth (disambiguation). Formerly, Sauer (1955) classified the genus into two subgenera, differentiating only between monoecious and dioecious species: Acnida (L.) Aellen ex K.R. Robertson and Amaranthus. Although this classification was widely accepted, further infrageneric classification was (and still is) needed to differentiate this widely diverse group. Known to the Aztecs as huāuhtli, amaranth is thought to have represented up to 80% of their energy consumption before the Spanish conquest. 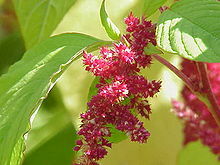 Another important use of amaranth throughout Mesoamerica was to prepare ritual drinks and foods. To this day, amaranth grains are toasted much like popcorn and mixed with honey, molasses, or chocolate to make a treat called alegría, meaning "joy" in Spanish. Diego Durán described the festivities for Huitzilopochtli, the name of which means "left side of the hummingbird" or "hummingbird left-hand" (Real hummingbirds feed on amaranth flowers). The Aztec month of Panquetzaliztli (7 December to 26 December) was dedicated to Huitzilopochtli. People decorated their homes and trees with paper flags; ritual races, processions, dances, songs, prayers, and finally human sacrifices were held. This was one of the more important Aztec festivals, and the people prepared for the whole month. They fasted or ate very little; a statue of the god was made out of amaranth seeds and honey, and at the end of the month, it was cut into small pieces so everybody could eat a little piece of the god. After the Spanish conquest, cultivation of amaranth was outlawed, while some of the festivities were subsumed into the Christmas celebration. Because of its importance as a symbol of indigenous culture, its palatability, ease of cooking, and a protein that is particularly well-suited to human nutritional needs, interest in grain amaranth (especially A. cruentus and A. hypochondriacus) revived in the 1970s. It was recovered in Mexico from wild varieties and is now commercially cultivated. It is a popular snack sold in Mexico, sometimes mixed with chocolate or puffed rice, and its use has spread to Europe and parts of North America. Amaranth and quinoa are not grasses and are called pseudocereals because of their similarities to cereals in flavor and cooking. A small amount of seed plants a large area (seeding rate 1 kg/ha). Its seeds are a good source of protein. In cooked and edible forms, amaranth retains adequate content of several dietary minerals. As befits its weedy life history, amaranth grains grow rapidly and, in three cultivated species of amaranth, their large seedheads can weigh up to 1 kg and contain a half-million small seeds. In Indonesia and Malaysia, leaf amaranth is called bayam. In the Philippines, the Ilocano word for the plant is kalunay; the Tagalog word for the plant is kilitis or kulitis. In Uttar Pradesh and Bihar in India, it is called chaulai and is a popular green leafy vegetable (referred to in the class of vegetable preparations called saag). It is called chua in Kumaun area of Uttarakhand, where it is a popular red-green vegetable. In Karnataka in India, it is called harive. It is used to prepare curries such as hulee, palya, majjigay-hulee, and so on. In Kerala, it is called cheera and is consumed by stir-frying the leaves with spices and red chillies to make cheera thoran. In Tamil Nadu, it is called mulaikkira and is regularly consumed as a favourite dish, where the greens are steamed, and mashed, with light seasoning of salt, red chili, and cumin. It is called keerai masial. In Andhra Pradesh, this leaf is added in preparation of a popular dal called thotakura pappu in (Telugu). In Maharashtra, it is called shravani maath and is available in both red and white colour. In Orissa, it is called khada saga, it is used to prepare saga bhaja, in which the leaf is fried with chili and onions. In China, the leaves and stems are used as a stir-fry vegetable, or in soups. In Vietnam, it is called rau dền and is used to make soup. Two species are popular as edible vegetable in Vietnam: dền đỏ (Amaranthus tricolor) and dền cơm or dền trắng (Amaranthus viridis). A traditional food plant in Africa, amaranth has the potential to improve nutrition, boost food security, foster rural development and support sustainable land care. In Bantu regions of Uganda and western Kenya, it is known as doodo or litoto. It is also known among the Kalenjin as a drought crop (chepkerta). In Lingala (spoken in the Congo), it is known as lɛngalɛnga or bítɛkutɛku. In Nigeria, it is a common vegetable and goes with all Nigerian starch dishes. It is known in Yoruba as shoko a short form of shokoyokoto (meaning make the husband fat) or arowo jeja (meaning "we have money left over for fish"). In the Caribbean, the leaves are called bhaji in Trinidad and callaloo in Jamaica, and are sautéed with onions, garlic, and tomatoes, or sometimes used in a soup called pepperpot soup. In Botswana, it is referred to as morug and cooked as a staple green vegetable. In Greece, green amaranth (A. viridis) is a popular dish called βλήτα, vlita or vleeta. It is boiled, then served with olive oil and lemon juice like a salad, sometimes alongside fried fish. Greeks stop harvesting the plant (which also grows wild) when it starts to bloom at the end of August. In Brazil, green amaranth was, and to a degree still is, frequently regarded as an invasive species as all other species of amaranth (except the generally imported A. caudatus cultivar), though some have traditionally appreciated it as a leaf vegetable, under the names of caruru or bredo, which is consumed cooked, generally accompanying the staple food, rice and beans. 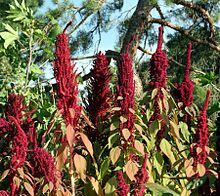 The flowers of the 'Hopi Red Dye' amaranth were used by the Hopi (a tribe in the western United States) as the source of a deep red dye. Also a synthetic dye was named "amaranth" for its similarity in color to the natural amaranth pigments known as betalains. This synthetic dye is also known as Red No. 2 in North America and E123 in the European Union. The genus also contains several well-known ornamental plants, such as Amaranthus caudatus (love-lies-bleeding), a vigorous, hardy annual with dark purplish flowers crowded in handsome drooping spikes. Another Indian annual, A. hypochondriacus (prince's feather), has deeply veined, lance-shaped leaves, purple on the under face, and deep crimson flowers densely packed on erect spikes. Amaranths are recorded as food plants for some Lepidoptera (butterfly and moth) species including the nutmeg moth and various case-bearer moths of the genus Coleophora: C. amaranthella, C. enchorda (feeds exclusively on Amaranthus), C. immortalis (feeds exclusively on Amaranthus), C. lineapulvella, and C. versurella (recorded on A. spinosus). A new herbicide-resistant strain of Amaranthus palmeri has appeared; it is glyphosate-resistant and so cannot be killed by herbicides using the chemical. Also, this plant can survive in tough conditions. The species Amaranthus palmeri (Palmer amaranth) causes the greatest reduction in soybean yields and has the potential to reduce yields by 17-68% in field experiments. Palmer amaranth is among the "top five most troublesome weeds" in the southeast of the United States and has already evolved resistances to dinitroaniline herbicides and acetolactate synthase inhibitors. This makes the proper identification of Amaranthus species at the seedling stage essential for agriculturalists. Proper weed control needs to be applied before the species successfully colonizes in the crop field and causes significant yield reductions. An evolutionary lineage of around 90 species within the genus has acquired the C4 carbon fixation pathway, which increases their photosynthetic efficiency. This probably occurred in the Miocene. ^ "Amaranthaceae | plant family". Encyclopædia Britannica. Retrieved 2015-06-02. ^ a b c Bensch; et al. (2003). "Interference of redroot pigweed (Amaranthus retroflexus), Palmer amaranth (A. palmeri), and common waterhemp (A. rudis) in soybean". Weed Science. 51: 37–43. doi:10.1614/0043-1745(2003)051[0037:IORPAR]2.0.CO;2. ^ RHS A–Z encyclopedia of garden plants. Dorling Kindersley. 2008. p. 1136. ISBN 978-1405332965. ^ a b Juan; et al. (2007). "Electrophoretic characterization of Amaranthus L. seed proteins and its systematic implication". Botanical Journal of the Linnean Society. 155: 57–63. doi:10.1111/j.1095-8339.2007.00665.x. ^ a b Costea M, DeMason D (2001). "Stem morphology and anatomy in Amaranthus L. (Amaranthaceae)- Taxonomic significance". Journal of the Torrey Botanical Society. 128 (3): 254–281. doi:10.2307/3088717. JSTOR 3088717. ^ Mosyakin & Robertson (1996). "New infrageneric taxa and combinations in Amaranthus (Amaranthaceae)". Ann. Bot. Fennici. 33: 275–281. ^ a b "Search results — The Plant List". theplantlist.org. ^ "Amaranth grain, cooked". USDA National Nutrient Database, release SR-28. 2015. Retrieved 4 February 2016. ^ "Amaranth leaves, cooked, boiled, drained, without salt, per 100 g". Conde Nast for the USDA National Nutrient Database, release SR-21. 2015. Retrieved 4 February 2016. ^ Lamacchia C, Camarca A, Picascia S, Di Luccia A, Gianfrani C (Jan 29, 2014). "Cereal-based gluten-free food: how to reconcile nutritional and technological properties of wheat proteins with safety for celiac disease patients". Nutrients (Review). 6 (2): 575–90. doi:10.3390/nu6020575. PMC 3942718. PMID 24481131. ^ Gallagher, E.; T. R. Gormley; E. K. Arendt (2004). "Recent advances in the formulation of gluten-free cereal-based products". Trends in Food Science & Technology (Review). 15 (3–4): 143–152. doi:10.1016/j.tifs.2003.09.012. ^ "Legacy: The Official Newsletter of Amaranth Institute" (PDF). Amaranth Institute. 1992. pp. 6–9. Archived from the original (PDF) on 2012-10-12. Retrieved 2011-09-19. ^ Coe, S.D. (1994). America's First Cuisines. University of Texas Press. ISBN 9780292711594. ^ Costea et al. (2006). Delimitation of A. cruentus L. and A. caudatus L. using micromorphology and AFLP analysis: an application in germplasm identification. Genetic Resources and Crop Evolution 53: 1625-1633. ^ Marx (1977). Speaking of Science: Amaranth: A Comeback for the Food of the Aztecs? Science 198(4312): 40. ^ De Macvean & Pöll (1997). Chapter 8: Ethnobotany. Tropical Tree Seed Manual, USDA Forest Service, edt. J.A Vozzo. ^ a b Tucker, J. (1986). Amaranth: the once and future crop. Bioscience 36(1): 9-13. ^ "USDA National Nutrient Database: cooked amaranth grain per 100 grams; Full report". 2014. Retrieved 30 November 2015. ^ National Research Council (2006-10-27). "Amaranth". Lost Crops of Africa: Volume II: Vegetables. Lost Crops of Africa. 2. National Academies Press. ISBN 978-0-309-10333-6. OCLC 34344933. Retrieved 2008-07-15. ^ Goode, P. M. (1989). Edible plants of Uganda. Food and Agriculture Organization of the United Nations. pp. 25–6. ISBN 9789251027134. ^ Enama, M. (1994). "Culture: The missing nexus in ecological economics perspective". Ecological Economics. 10 (10): 93–95. doi:10.1016/0921-8009(94)00010-7. ^ He, Han-Ping; Cai, Yizhong; Sun, Mei; Corke, Harold (2002). "Extraction and Purification of Squalene from Amaranthus Grain". Journal of Agricultural and Food Chemistry. 50 (2): 368–372. doi:10.1021/jf010918p. ISSN 0021-8561. ^ "Squalene Market Size to Exceed USD 240 Million by 2022". Global Market Insights Inc. 27 April 2016. Retrieved 14 December 2016. ^ Wetzel et al. (1999). Use of PCR-based molecular markers to identify weedy Amaranthus species. Weed Science 47: 518-523. ^ Culpepper et al. (2006). Glyphosate-resistant Palmer amaranth (Amaranthus palmeri) confirmed in Georgia. Weed Science 54: 620-626. ^ Sage, R.F. (2016). "A portrait of the C4 photosynthetic family on the 50th anniversary of its discovery: species number, evolutionary lineages, and Hall of Fame". Journal of Experimental Botany. 67 (14): 4039–4056. doi:10.1093/jxb/erw156. ISSN 0022-0957. PMID 27053721. Wikimedia Commons has media related to Amaranthus.